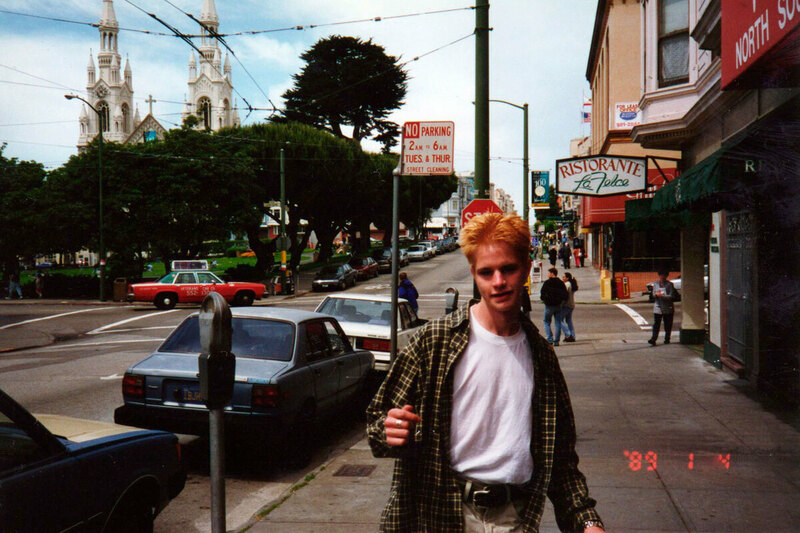 Matthew Shepard Laid To Rest At Washington National Cathedral Twenty years ago, the brutal killing of a young gay man in Laramie, Wyo., drew national attention and led to an expansion of a federal hate-crimes law. 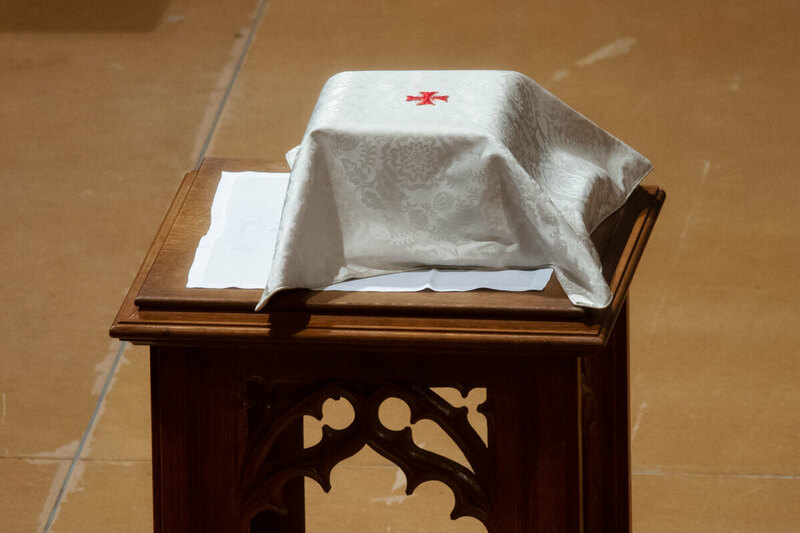 Matthew Shepard's ashes were interred at Washington National Cathedral on Friday after a public remembrance in the filled cathedral. Matthew Shepard, the young gay man brutally killed on a chilly night in Wyoming 20 years ago this month, was finally laid to rest at Washington National Cathedral on Friday. 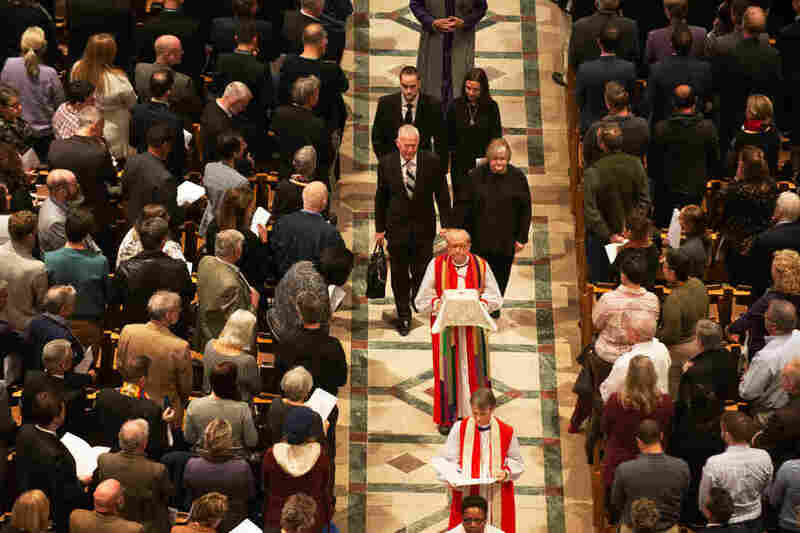 A reflective, music-filled service offered stark contrast to the anti-gay protests that marred his funeral two decades ago. 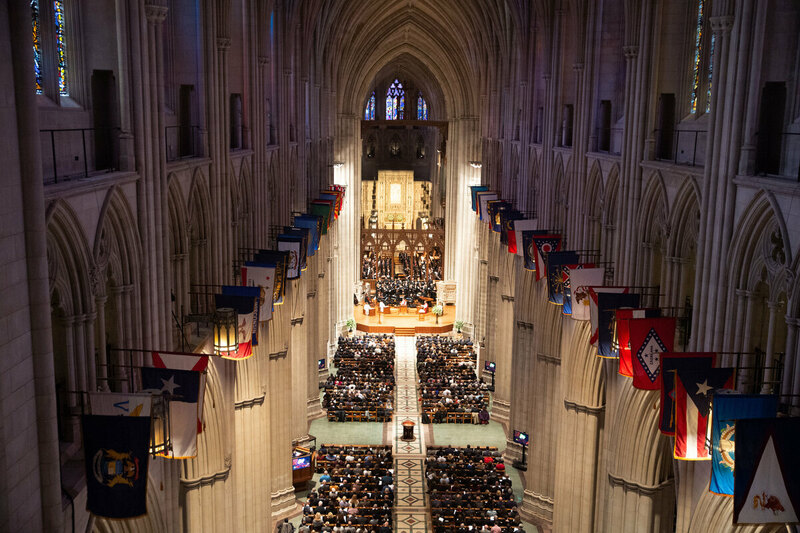 The public remembrance at the filled 4,000-seat cathedral was led by the Right Rev. Mariann Edgar Budde, Episcopal bishop of Washington, and the Right Rev. Gene Robinson, the first openly gay man elected a bishop in the Episcopal Church. After, his ashes were interred at the cathedral's crypt in a private family ceremony. 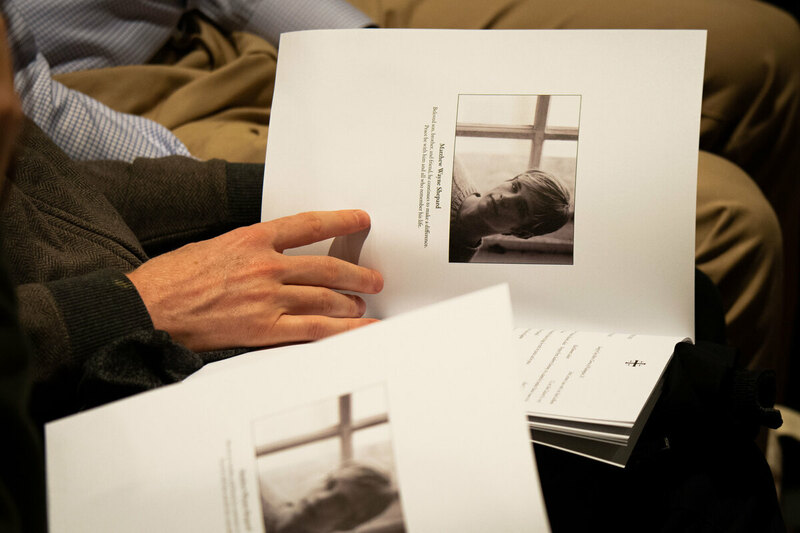 A program from Matthew Shepard's public remembrance at the National Cathedral in Washington, D.C. on Friday. Robinson was emotional throughout the public ceremony, tearfully addressing the large crowd. "For Matthew to come back to church," he said, "is a remarkable step forward." He extended a particular welcome to attendees who are LGBT, saying, "Many of you have been hurt by your own religious communities, and I want to welcome you back." Shepard's parents requested that their son's ashes be interred at the cathedral after 20 years of reluctance. They feared his gravesite would be desecrated. "Matthew loved the church," said Shepard's father, Dennis. "He loved the fact that it was a safe place for anyone who wanted to enter." "It's so important that we now have a home for Matt ... A home that is safe from haters. A home that he loved dearly." Matthew Shepard's family leaves with his remains after public ceremony at the National Cathedral in Washington, D.C. on Friday. Robinson also offered lengthy praise of Shepard's parents, who have devoted their lives to activism and created a foundation in their son's name. "By the grace of God," he said, "they decided they were going to turn this horrendous event into something good." "Gently rest in this place, you are safe now. Matthew, welcome home," Robinson said. Judy and Dennis Shepard at the public ceremony. The Shepards have devoted their lives to activism and created a foundation in their son's name. In October 1998, Shepard was beaten unconscious by two men he had encountered in a bar in Laramie, Wyo. After robbing him, the men left 21-year-old Shepard tied to a fence on the outskirts of town. Eighteen hours passed before he was found by passing bicyclists. He died from his injuries five days later without regaining consciousness. Prosecutors alleged that Shepard was targeted simply because he was gay. The men charged with his murder, Aaron McKinney and Russell Henderson, were sentenced to life in prison, where they remain. In the years since, the circumstances surrounding the case have been disputed, but Shepard's murder has nevertheless come to be seen as a classic hate crime, highlighting anti-gay bigotry. Four months before Shepard was killed, white supremacists in Texas had tied an African-American man, James Byrd Jr., to a pickup truck and dragged him to his death. Outrage over the two brutal murders ultimately led to the passage of the Shepard/Byrd Hate Crimes Prevention Act in 2009. Matthew Shepard, seen here in San Francisco in 1989, was beaten and left to die 20 years ago in what was widely seen a crime of hate. The act expanded an existing federal hate-crimes law to include crimes based on a victim's sexual orientation, gender identity or disability. Shepard's killing became the basis for a play, The Laramie Project, which brought widespread attention to the problem of homophobia. Shepard's parents, Dennis and Judy Shepard, established the Matthew Shepard Foundation and became activists for gay rights and more vigorous prosecution of hate crimes. Shepard's funeral in 1998 was met with noisy protests by anti-gay militants. The decision to seek his interment at Washington National Cathedral came as a result of the Shepards' friendship with Bishop Robinson. Robinson contacted the cathedral dean, the Rev. Randolph Marshall Hollerith, and Washington's Episcopal bishop, Budde, both of whom readily agreed to the placement of Shepard's ashes in the cathedral crypt. "The Shepards realized they had not come to full closure" over their son's murder, Robinson told NPR in an interview prior to the interment ceremony. "They began to think this might be the time to lay Matthew to rest." Shepard's ashes were interred at the cathedral's crypt in a private family ceremony. 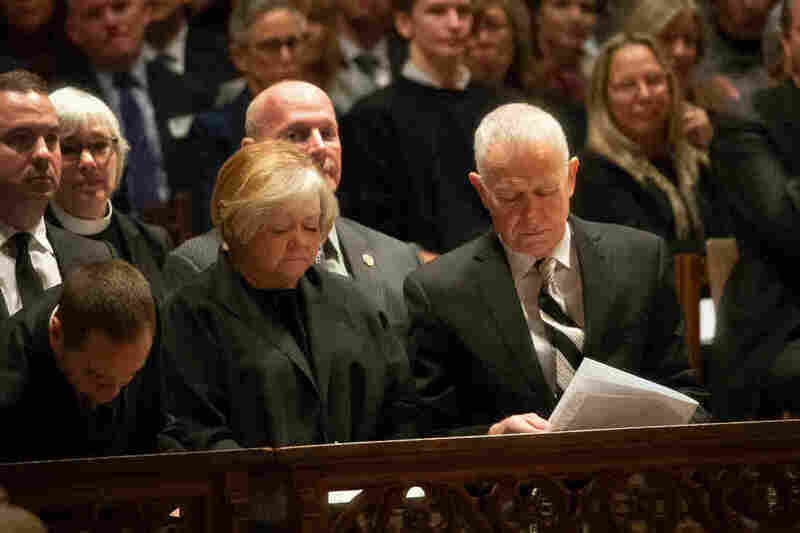 In addition, Robinson said, Shepard's interment at the cathedral is significant for the LGBTQ community in the United States, which has faced hostility from many people in conservative faith circles. "Let's be honest," Robinson said. "Churches and synagogues and mosques have been the source of our greatest pain as LGBTQ people." Robinson himself was vilified after revealing his sexual orientation, and his election as Episcopal bishop of New Hampshire in 2003 led to a split in the U.S. Episcopal Church. "For Matthew to come back to church ... is a remarkable step forward," Robinson said. "It's the cathedral saying some churches are different. Some churches have been on this journey with you, and we will not only welcome you, we will celebrate you." Attendees embrace during the service at the National Cathedral in Washington, D.C. on Friday. Bishop Budde similarly sees the interment of Matthew Shepard in the cathedral crypt as having broad significance. Other notable figures whose remains are there include President Woodrow Wilson; Navy Adm. George Dewey; and Helen Keller and her teacher, Anne Sullivan. "There will be young people from all across the country, having tours here and being educated here," she said. "When they pass by, they will see a plaque in his honor. They will see that this is a church that has learned from the example of violence that we need to stand and be counted as among those who work for justice and the full embrace of all God's children."